Arrive at Tokyo Airport and transfer to your tour hotel in central Tokyo this evening. We will have a welcome dinner at a local restaurant. Our first full day in Japan is a walking tour of Tokyo. We start at the Grand Meiji Shrine in the Omotesando area which is located near Harajuku, an area famous for its avant-garde fashion and architecture. Later we visit the Hama-Rikyu Gardens, located near the mouth of the Sumida-gawa River. There is a striking contrast between the gardens and the gleaming towers of the new Shiodome business area beyond. For those who are interested in further exploration, we will continue to Ginza, the elegant Ginza shopping district. We will travel by foot and subway/light rail today. 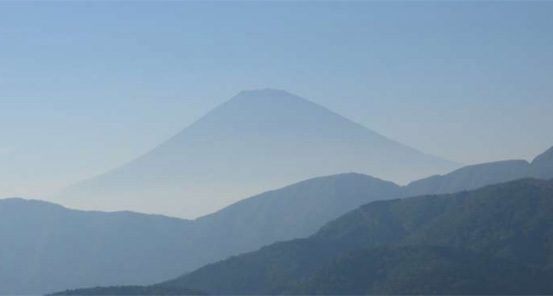 We will enjoy a day in Hakone, and travel by ropeway and cable car over the peaks of the Mt Fuji area, in hopes of catching sight of this notoriously shy icon of Japan. We then enjoy a cruise on Lake Ashi-no-ko, and enjoy a short walk along the ‘sugi-namiki’, a trail lined with Japanese cedar trees that once formed part of the old Tokaido highway, or ‘East Sea Road’ to the Hakone Checkpoint Museum, a stop that once controlled traffic between Tokyo and Kyoto. If the workshop is open, we may also be able to see a demonstration of traditional Japanese yosegi or traditional Japanese parquetry. We will arrive at our hotel mid-afternoon. Following an early dinner, we have the evening free. Today we travel by train to Yudanaka Onsen, a hot spring village famous for its 'snow monkeys'. The Japanese macaques originally came here to warm themselves in the outdoor hot spring bath during the cold winters, and now come all year round. We then stay in a Japanese ryokan, known for its onsen (a Japanese hot spring and the bathing facilities and inns)! We travel first to the city of Matsumoto to see its beautiful castle, built in the 16th century. Then, after a tour of a miso factory and miso-based lunch, we continue by train to the Kiso Valley and the small town of Narai with its traditional atmosphere of ancient Nakasendo Way, between Kyoto and Tokyo (or Edo as the city was known in the feudal period). There are many well-preserved houses and former inns. After breakfast, there will be time to wander the beautiful streets of Narai. The village is a good place to buy lacquerware and woodcrafts. Short train and bus journeys bring us to the village of Tsumago. 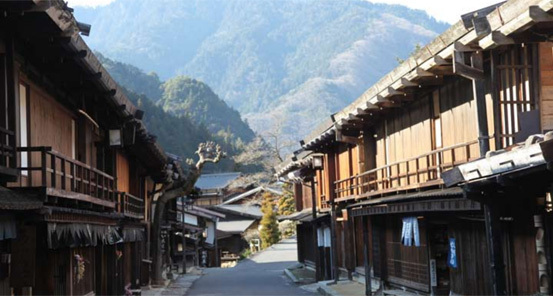 Another of the post-towns on the former Nakasendo trail, Tsumago has been beautifully preserved - a living museum, which is still inhabited by the local residents. Wander the streets, taste gohei- mochi (skewered balls of pounded sticky rice covered in a sweet paste of miso, sesame and walnuts), and visit the folk museum. From here, the trail winds its way over the Magome Pass for just over 8 kilometres/5 miles to the neighboring town of Magome (elevation gain: 326m/1069 feet of ascent and 430m/1410 feet of descent). You will have the opportunity to walk this lovely section of the trail through forest and countryside, past farms, rice fields, traditional houses and pretty gardens. The local bus provides an alternative for those not wishing to walk. We will arrive in time to check in to our Minshuku, a small family-run inn. After breakfast, we stroll through Magome and then travel by bus and train to Takayama. Takayama has retained much of its traditional architecture and is well-known for its crafts, particularly yew-wood carving, Shunkei lacquerware, pottery and furniture. After arriving at our inn, there may be time to explore the surrounding areas and relax in a hot spring bath before dinner. In the evening we will try the local Hida beef and perhaps some locally-brewed saké. Today we have a full day of walking in Takayama, starting with a visit to the morning market, with stalls of vegetables, crafts, pickles and souvenirs. We see the Yoshijima Heritage House, a precious wooden structure with a famously refined architectural interior. We wander the San-machi area with its rows of old merchant houses, some open as museums. After lunch there will be free time for you to explore the city further and hunt for special treasures to bring home. In the morning, you have a few more hours free to stroll. After lunch, we travel to the village of Ogimachi in the Shirakawa-go area, northwest of Takayama. 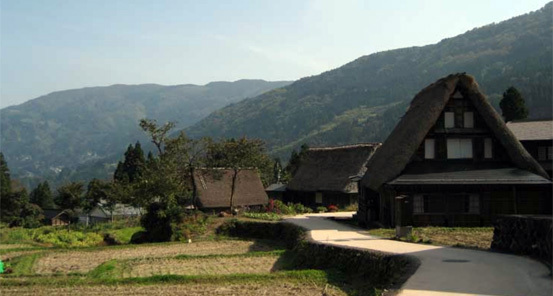 The village is home to a large number of gassho-zukuri houses, and has been a UNESCO World Heritage Site since 1995. These large wooden houses have steep thatched roofs designed to withstand heavy snow, and the term gassho-zukuri refers to the shape of praying hands formed by the roofs. In feudal times Kanazawa was the seat of the Maeda clan, one of Japan’s most powerful, and it rivalled Kyoto and Edo (Tokyo). Kanazawa consists of a number of smaller well-preserved historical districts. Following our arrival in Kanazawa, we’ll visit the Omicho market – notable for its variety of seafood and produce. A brief walk from a bustling shopping district takes you to a tranquil neighborhood of former samurai homes and gardens. Their traditional buildings and cobblestoned lanes remain. We will enjoy lunch at the local museum today and afterwards, you will have time to visit the museum or explore independently. One of the highlights of Kanazawa is the traditional Kenrokuen Garden, designed as a formal walking garden that displays changing vistas as you make your way along its pathways. Kenrokuen was once the outer garden of Kanazawa Castle. Stone lanterns, koi ponds, and small teahouses dot the scenery. On the periphery of the garden are a number of museums with collections of artefacts collected by the eminent lords of the Kanazawa area. You will also find a number of older teahouse areas – the most notable of these being the Higashichaya, and Kazuemachi Chaya districts - where Kanazawa’s geisha entertained with music and dance. We travel by train to Kyoto and our hotel in the center of the city. In the evening we take a walk through the Gion district, famous for its many ryotei (exclusive private restaurants) and the geiko (full- fledged geisha) or maiko (apprentice geisha). We also visit the Sanjo-ohashi Bridge, the western end of the Nakasendo Trail. We have a half-day walking tour this morning. We visit the famous Kinkaku-ji, the Golden Pavilion, originally built by the Ashikaga Shogun in the 14th century as a place of contemplation and rest. From there, we will visit Ryoan-ji, with its famous rock garden of raked gravel and fifteen moss-covered boulders. You have free time in the afternoon so you can explore the area further or shop for crafts. 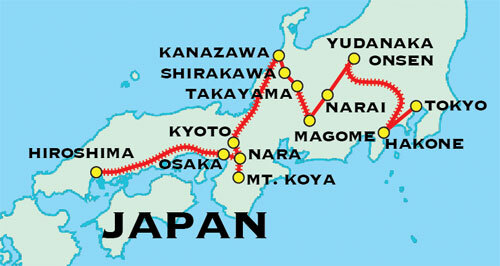 The ancient city of Nara, which preceded Kyoto as Japan’s capital from 710 to 784, is one hour south of Kyoto by train. We will visit Todai-ji Temple, with its bronze statue of Buddha. The temple is said to be the largest wooden structure in the world. Next we will visit the old merchant district of Nara-machi with its narrow streets, shops, cafes and restaurants, or we may instead walk along the back road from Todai-ji to Kasuga Taisha Shrine. Today we enjoy a further day to discover Nara. We’ll enjoy a walk (optional) of the Yamanobe-no-michi. 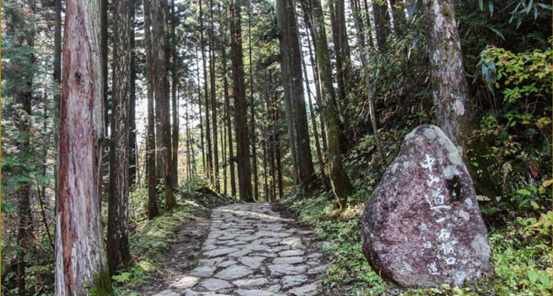 The Yamanobe-no-michi is said to be the oldest road in Japan. It features in the ancient 'Nihon- shoki' and 'Kojiki' texts chronicling the founding and early years of the Japanese state. The rulers of the Yamato region on the Nara plain were the first to form a central government and formalise the Japanese nation about 1500 years ago. Our walk will last approximately 3 hours (4.3 miles/7 km on paved dirt trails and village roads). The walk is optional and those wishing not to participate can spend free time discovering Nara instead. This morning we travel to Hiroshima. Known throughout the world as the first city to bear the impact of the use of atomic weapons, Hiroshima today is a vibrant, modern city. Throughout the Peace Park are a number of touching memorials, including the Children’s Peace Monument, festooned with brightly colored strings of origami cranes, left by children from all over the world to express a desire for peace. The Peace Memorial and Museum provides context to the impact of the bombing on the city, the country, and the world. This morning, following breakfast at our hotel, we will depart by bullet train for Himeji. Himeji Castle is nicknamed "White Heron" Castle because of its white walls covered with white plaster. Himeji Castle is famous for both its huge main tower and its maze-like design. As one of the finest surviving examples of early 17th-century Japanese castle architecture, it is a masterpiece of construction. The castle has recently completed extensive restoration works. We travel along the scenic Nankai Railway Line to Mount Koya, a bowl-shaped valley filled with cedars high in the mountains of the Kii Peninsula. 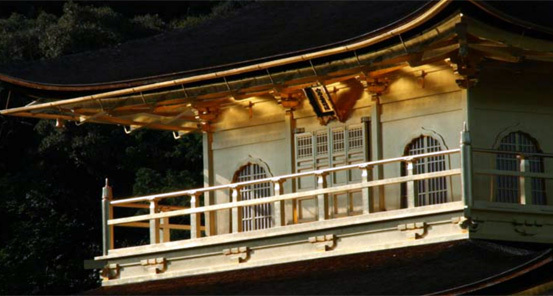 Since the 9th century Mount Koya has been a place of religious devotion and ceremony. Today there are more than 100 monasteries, many of which have Shukubo (Pilgrims lodging). We stay in one of the elegant temples and dine on shojin-ryori (Buddhist vegetarian cuisine). We walk through the vast Okuno-in cemetery, with thousands of graves and memorials to feudal lords and other past luminaries. This morning we rise early to enjoy a morning prayer service with the monks at our Shukubo and then leave the peaceful tranquillity of Koyasan behind for the bright lights and hustle and bustle of Osaka - the epitome of modern Japan. It is considered to be the commercial hub of Japan. Behind the neon glare, against the chrome and glass of new skyscrapers and developments, Osaka offers some surprises. We’ll visit Shitennoji Temple. We then visit central Osaka – the Dotonbori area. which we will explore on foot. Within steps of the bright lights and buzz of the main thoroughfare of Dotonbori and Ebisu Bridge, we will find hidden shrines and markets nestled in the side streets. Today, we transfer to the airport for our flights homebound.